Thanks to Carrie Fisher, we got to see Leia grow from a brave and feisty princess into a seasoned leader, senator, mother, then general of the Resistance. In 1977 movies changed forever. Star Wars brought with it the merchandising bonanza that we now see in every section of Target, the modern sequalized mega-hit that has been repeated time and again, and provided the world a rich new culture that has spawned conventions, cosplay, and even charity groups in every corner of the globe. Star Wars changed everything. I’ve been a Star Wars fan my entire life. It’s a galaxy far, far away where you can find inspiring stories, unforgettable characters, and amazing action. When I first saw Star Wars, the personalities of the central heroes blasted right off the screen. Luke, the inexperienced farm boy thrust into a hero’s journey; Han, the dashing rogue with the cool ship and quick blaster; Chewbacca, the ultimate in big hairy sidekicks who spoke in roars and chuckles; and Leia, the princess with a pistol who could stand up to even the darkest of villains without so much as flinching. Earlier this week we lost that princess when Carrie Fisher, the quick-witted comedian, mental health advocate, and pinnacle of Star Wars royalty died at age 60. She was best known for her portrayal of Princess Leia Organa, but she also drew on her tumultuous upbringing as a child of Hollywood, her past illegal drug use, and her struggles with mental health to produce some great comedy. Her semi-biographical novel turned movie “Postcards from the Edge” shed some light on her drug use, acting career, and sometimes rocky relationship with mother Debbie Reynolds. Her most recent book, “The Princess Diarist,” unveiled her affair with Star Wars co-star Harrison Ford during the filming of the original movie in 1976. The secret was somehow kept for 40 years. But it was as Princess Leia that I initially grew to love Fisher. Her portrayal of the punchy leader in the Rebel Alliance who fought against the evil Empire from a very young age was so fun to watch. Through “A New Hope,” “Empire Strikes Back,” “Return of the Jedi,” and most recently “The Force Awakens,” we got to see Leia grow from a brave and feisty princess into a seasoned leader, senator, mother, then general of the Resistance. She was the original Star Wars role model for little girls. Rey and Jyn Erso get all the attention now as inspirations for young female fans, but Fisher’s Princess Leia was there first. 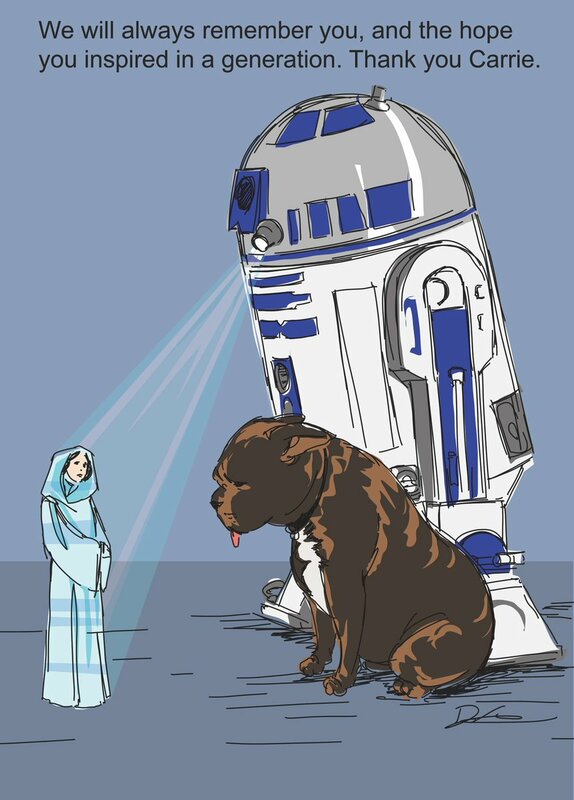 Lucasfilm animation head Dave Feloni had what I think was the most artistic tribute to Fisher with his sketch of R2-D2 and Gary, Fisher’s famous French bulldog who traveled the world with her, observing the “Help me Obi-Wan Kenobi” hologram of Princess Leia from Star Wars: A New Hope,” Gary’s head hanging sadly. The man under Chewbacca’s mask, Peter Mayhew, had a poignant tribute to Fisher with the posting of great personal pictures of them through the years and a note of remorse. To honor Carrie Fisher and the Star Wars princess she played so well onscreen, I baked Chewbacca’s Wookiee Cookies. Baking is not my strong suit. I generally leave it up to my wife, but for this week it was impossible for me to resist giving these cookies from an official Star Wars cookbook a shot. These are chocolate chip cookies taken to the heights of a galaxy far, far away. They have two kinds of chocolate chips, some rich brown sugar, and a roar of Wookiee magic that combines to make for a scrumptious treat. Here’s what you’ll need to get started. I made these with my kids because they’re off school this week, and it would be impossible to bake cookies in my house without them knowing. It is actually a good way to teach them the basics of baking. Before you begin making the cookies, preheat your oven to 375 degrees. First you add the flour, baking soda, salt, and cinnamon to a mixing bowl and stir to combine. This was my daughter’s job, something she fondly calls “mixa, mixa!” Once that’s done, set this bowl aside and move over to your mixer. My wife is a baker, so we have a KitchenAid stand mixer, but an electric hand mixer works well too. Add the butter and the brown and white sugars to the mixer, set it to high speed, and blend it until it’s this amazingly creamy, you just gotta lick some off your finger goodness. It takes about three minutes. Once that is done, add in your two eggs and the vanilla extract. Blend it some more to mix in the eggs. Now comes the dirty part. Using the wooden spoon, slowly add the flour mixture to the mixing bowl. Don’t leave it on high, or you’ll get flour all over the place. I put it on just shy of medium speed and added each spoonful of the dry ingredients, waiting for the previous spoonful to incorporate into the batter first. Once you’re all done, throw in the chocolate chips, mix them on low, and you’re done making the dough. I will warn you: this makes the best raw cookie dough you’ve ever had. It’s tempting to stop here and eat all the dough. No matter how much you want to, don’t do it. Instead, grab a spoon or ice cream scoop and use it to measure out each cookie onto a cookie sheet lined with parchment paper. You can fit about a dozen at a time. Put them in your pre-heated oven for about 10-12 minutes until they are just starting to get golden brown. Pull them out and set them on a cooling rack. Now comes the hardest part: waiting. After about five minutes or so, they should be cool enough to eat. If you do it right, they’ll be a little crunchy around the edges but still gooey on the inside. Now sit down, watch some Star Wars, and enjoy a Wookiee Cookie in honor of the woman who brought Princess Leia to life. As Yoda says, “Rejoice for those around you who transform into The Force.” May The Force be with Carrie Fisher.